Younger discontented voters regardless of party affiliation agree on this thing. camera (David McNew/Getty Images) In this Sept. 22, 2012 fiel photo, students protest the rising costs of student loans for higher education in the Hollywood section of Los Angeles, California. Though politicians fall all over themselves when it comes to voters in my age bracket and even older (that's almost impossible to comprehend), a new survey by Harvard's Institute of Politics shows a growing class of discontented, registered voters who agree that there is one major issue among them regardless of party affiliation: that class is millennials, and that issue is student loan debt. Despite being ignored by many politicians (unless it's for a photo op), fully 68 percent of the 18- to 29-year-olds surveyed are already registered to vote. Their approval of President Obama is near an all-time low, their approval ratings of Congressional Democrats and Republicans is close to zero and almost half of them (49 percent) think this country is headed in the wrong direction. A majority of them would recall the entire Congress -- and 45 percent of them would recall their own representatives. Although the impression of many people in my age bracket is that all young people these days are liberal, that's not true: 37 percent of them self-identify as conservative or leaning conservative compared to the 33 percent that identify as liberals. The only good news for Democrats is that 33 percent of millennials identify with the Democratic party – mirroring the percentage of self-identified liberals – but only 24 percent identify as Republican. Democrats might not have to worry (yet) about losing liberal millennials' affections, but Republicans seemingly already have. 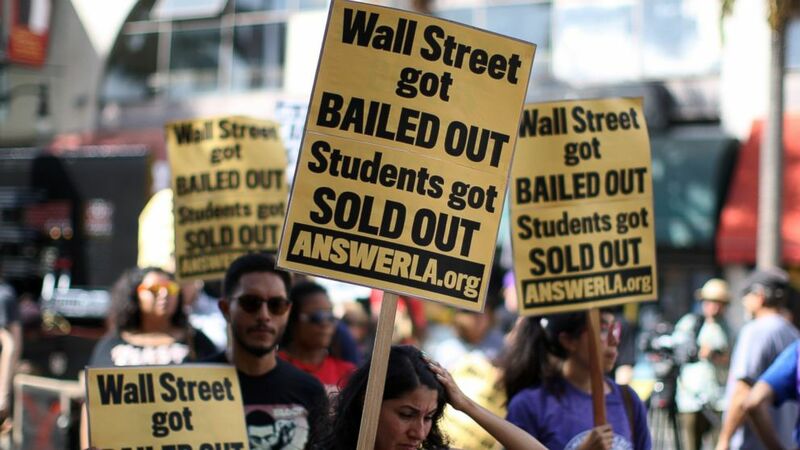 They do generally agree on one thing: student loan debt is out of control. About 42 percent of millennials say they or someone in their household has student loan debt, but 57 percent say that they think student loan debt is a major problem, while a grand total of 79 percent think it's generally a problem. Why so much agreement? Well, for starters, there are 14 million people under the age of 30 with outstanding student loans. The average debt load for someone who graduated in 2012 was a staggering $29,400 – but the unemployment rate in that age bracket was 11.6 percent in November and, for those who are employed, the average annual earnings for those in the 16-24 age bracket ranges from just over $21,000 for women to just over $24,000 for men (regardless of educational attainment, though it improves significantly for those over 25 with college educations). So many recent graduates are saddled with a debt burden close to or larger than the average annual salary for someone their age, and they'd be lucky to find a job at all. In fact, a Georgetown University Center on Education and the Workforce study earlier this year showed that the average millennial won't earn the median-wage annual income of $42,000 until they are 30 – a full four years later than those who came of age around 1980. Millennials know that it's increasingly hard to do as well as their own parents, if not better, and the path they're all trying to follow to achieve that goal – a college education – is getting much more expensive. And who do they think is responsible for that problem? Well, 30 percent blame the federal government for skyrocketing education costs, 42 percent blame institutions of higher education and another 8 percent blame state government officials. In other words, almost 40 percent of young people today blame the government for the staggering debt they've taken on to finance the paths that they were told (sometimes by the President himself) would lead to financial stability – debt that often gets repaid to the federal government itself. If you thought Social Security was the third rail of politics in the '80s and '90s, just wait until the next time Congress jerks around and dangles sky-high student loan interest rates in front of all those un- and underemployed millennials trying to pay off loans the size of the Greatest Generation's first mortgages. This is not the time for politicians to hide, ostrich-like, in plain sight and ignore the problems than have been created by sky-rocketing tuition rates, uncertainty about long-term interest rates on federally subsidized student loans and a global economy that increasingly demands a college diploma as the price of entry. It's not a time to point fingers at the other guys and blame them for their supposed past sins. If you haven't yet noticed, millennials are a pretty savvy generation and, as this poll shows, they're damn tired of being told to blame the other party for the problems that both created. Congress needs to step up to the plate and start taking millennials' concerns seriously, because their student debt burden – unlike Reagan's tax cuts – are going to trickle down throughout our economy, as the next generation finds itself unable to afford to buy houses, finance large purchases (like new cars) or even just make Black Friday actually black for retailers. If they can't find jobs, can't build good credit, can't achieve salary growth and continue to struggle under a massive debt burden from the second they start their adult lives, they aren't going to push the American economy to new heights, and we're all going to preside over its sputtering. It's time to look at solutions, like the ability of students to refinance their loans (as proposed by the CFPB) or even discharge them in bankruptcy. It's time to crack down on abuses, whether it's by non-bank student loan servicers operating with too little oversight or for-profit colleges that take students' money and provide little actual education or even not-for-profit colleges in which administrators too often seem to personally profit at the expense of students' education (and adjuncts' ability to earn a living wage). Because if politicians and regulators don't find some way to help our young people out, many of them may join them in the unemployment line sooner rather than later.